Jeff Denham’s California Congressional District 10 is purple—it’s almost equally divided between red (for Republican) and blue (for Democrat) voters. But despite the almost equal balance between Republicans and Democrats in his district, Jeff Denham votes with his Republican Party 97.8% of the time. Just for comparison’s sake, consider Representative Tom McClintock, Denham’s Republican colleague in nearby District 4. Even though his district leans far more heavily Republican than Denham’s “purple” 10th, McClintock votes with the party only 80.9% of the time. That’s still a significant margin, but it leaves McClintock enough room to favor his constituents when party policy might be against their best interests. But Jeff Denham isn’t the only Republican Congressman who votes with his party almost 100% of the time. Republicans Ken Calvert (98.9%), Devin Nunes (98.8%), and David Valadao ((98.9%) also vote almost entirely along party lines. Ken Calvert is recently notable for proposing legislation that would prohibit lawsuits against the Delta Twin Tunnels and California water projects in general. His 42nd Congressional District is in southern California, where much of the water needs are served by the Metropolitan Water District. The Metropolitan Water District (MWD) is, “the largest supplier of treated water in the United States.” But despite being served water from the San Joaquin Delta via the California Aqueduct and diverting vast volumes of water from the Colorado River, MWD is in constant need of water. The Colorado River itself has been running near dry for years, and groundwater in the Colorado River Basin is nearly exhausted. Thus, water allocations from the Colorado River and San Joaquin Delta are no longer sufficient to serve burgeoning southern California growth and the thirsty almond and pistachio orchards of the southern San Joaquin Valley. Enter the Delta Tunnels. 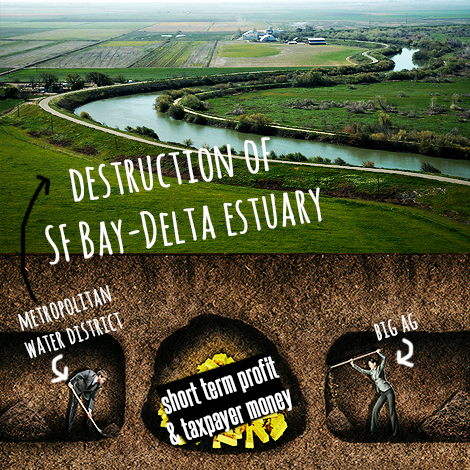 The major feature of the California Water Fix, the Delta Twin Tunnels would place forty-foot diameter tubes under the San Joaquin Delta for the purpose of delivering northern California water south to buyers in the southern San Joaquin Valley and beyond, including Los Angeles and the Metropolitan Water District. Proponents say the tunnels would deliver more water south with less harm to the Delta ecosystem. Opponents say the tunnels are just a faster, more efficient way to ruin the Delta and place even more stress on over-burdened California rivers. Devin Nunes and David Valadao are congressmen from districts in the southern San Joaquin Valley. Like Ken Calvert, they and their constituents depend on water from northern California, especially since the boom in permanent crops like nuts and grapes. Unlike the districts of Calvert, Nunes, and Valadao, Jeff Denham’s 10th Congressional District is water-rich—at least for the moment. Like other northern California districts, it’s threatened by new state water requirements for fish and the Delta ecosystem. 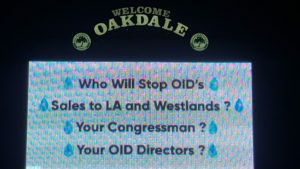 Despite threats to local water supplies, the Oakdale Irrigation District (OID), located within Denham’s 10th District, has a business plan that depends on selling water to buyers outside the region, most of them far to the south. OID’s Sacramento-based water attorney is a major contributor to Jeff Denham. So is one of its largest independent farmers. Even with water sales outside the district, OID farmers have enough water to buy it at prices below the cost of delivery. Farmers in the nearby foothills, however, are dependent on diminishing supplies of groundwater. As powerful as they are, Ken Calvert, Devin Nunes and David Valadao must keep the water coming or they will lose the support of their constituents, especially the support of entities like MWD and Big Ag. Yet another Republican Congressman stands to gain even more from northern California water deliveries. Kevin McCarthy (98.9% party supporter), in California’s 23rd District, is widely thought to be a leading contender to replace Paul Ryan as Speaker of the House when Ryan leaves office after this congressional session. McCarthy’s district encompasses most of Kern and Tulare Counties in the southern San Joaquin Valley. It even extends into the northern tip of Los Angeles. Kern County is where Stewart Resnick, another major donor to Congressman Jeff Denham, has most of his 180,000 acres of nut orchards. Resnick’s farm holdings consume over 400,000 acre feet of water every year, year after year. 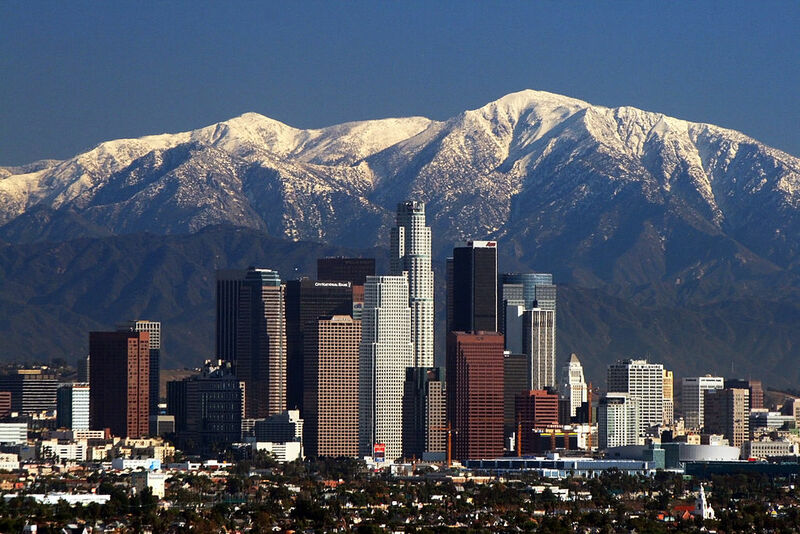 The City of Los Angeles itself consumes even more—well over half a million acre feet of water every year, year after year. Having reached the outer limits of their own water supplies long ago, the City of Los Angeles and the southern San Joaquin Valley still need water and lots of it. Sources like the Colorado River are no longer an option; they’re drained. But if Kevin McCarthy and his friends Ken Calvert, Devin Nunes, David Valadao and Jeff Denham can tap into northern California water for long-term deliveries, they won’t just become major players in the Republican Party, they could well become THE major players, especially if McCarthy becomes Speaker of the House. They will dominate Valley water and Valley politics for years. And though putting more stress on northern California rivers will hurt his own district over the long run—it’s already threatened by a state water “grab”—Jeff Denham supported Ken Calvert’s legislation to prevent litigation against the Delta Twin Tunnels. He did so because that’s what his party wants. He did so because the Twin Tunnels are where money and power can be delivered to the Republican Party for years and years to come. He did so because Jeff Denham puts his party over the people of his district. All those republicans must be defeated! Great analysis. And references. Thanks. As California cities run short of water they will seek to take it from smaller communities and food producers. Statewide water abundance is the only plausible long term strategy to protect our community. Denham is playing ball with other republicans and it is working. Witness the strong support that Interrior Secretary Zinke has given us in fighting back the water grab with federal authority. Also look at the recent water storage bill with strong DC support. Denham is effectively fighting for our community. Denham is delivering real solutions. The tunnels are a suboptimal answer to stupid questions. It is the Democratic rather than Republican interests that have made them a political imperative to statewide water security. This editorial targets the wrong players. John can you explain what you mean by this: Statewide water abundance? The original article is valid as it stands. Mr. Duarte is correct insofar as some Democrats are also willing to stab the tenth district in the back in order to take water for their constituents. As the state is run by Democrats, including Southern California, some Democrats will support efforts to take our water. What is not acceptable is the Congressman who is supposed to represent the tenth district, Jeff Denham, is not working to protect our water rights regardless of his recent proclamations. Water is NOT a partisan issue. Denham was elected to represent the interests of constituents of the tenth district, not Resnick and not Southern California. Denham is a miserable failure as a representative regardless of party affiliation. I find it fascinating that Mr. Caine has chosen to target Jeff Denham as the author and purveyor of the ill-advised, wasteful, and fabulously expensive Twin Tunnels project when the project is, in fact, being pushed and sponsored by Jerry Brown and the state’s leading Democrats from the southern part of California. Caine often finds Republicans to blame for most, if not all, of the social and economic ills of the Valley–even though the Democrats sit in every statewide office, have a near two-thirds majority in the legislature, and are backed by one of the most liberal state Supreme Courts in the nation, not to mention the indisputably most liberal of the appeals courts, the 9th Circuit. Mr. Caine, it would be refreshing to see you actually deign to criticize your own party even occasionally. California is being grossly mismanaged. But blaming Republicans for our shortcomings is patently and intellectually dishonest. Mr. Barton: Nowhere do I write Jeff Denham is the “author and purveyor” of the Twin Tunnels. And you can’t show that I’ve written such a thing. I DO write that Jeff Denham supported legislation disallowing litigation to prevent the Twin Tunnels AND I provide links to support that claim. I ALSO write the legislation was introduced by Republican Ken Calvert. Accuracy is something we at “The Valley Citizen” prize, Mr. Barton. And, we prefer that factual claims be supported, including our own. Again, nowhere have I written that Jeff Denham is the “author and purveyor” of the Twin Tunnels. What would be truly “refreshing” Mr. Barton, is to see you render accurate criticism as opposed to the construction of straw man arguments. Truly refreshing. Mr. Caine–you cannot tell me with a straight face that the Twin Tunnels project is being pushed and prodded by the GOP. That is laughable, and you know it. Jerry Brown has decided that the Bullet Train and Twin Tunnels will be his legacy public works projects–and he has the full support of the Dems who dominate the state legislature. Your gameplan is simple: denigrate your opponents by deluding yourself that your comments are always “factual”, while ignoring the truth about which party runs this state and is, therefore, largely responsible for the gross overspending and mismanagement which characterizes it. What would be truly refreshing–really refreshing–would be to see you reach beyond your own knee-jerk ideology to actually deign to criticize the party in power, rather than raking the feckless Republicans over the coals as you are so wont to do. Mr. Barton: My face has nothing to do with this. The rider was written by Congressman Calvert and approved by Jeff Denham. Both are Republicans. Those are verifiable claims. Your attempts to change the subject are patent, and your use of “feckless” quite appropriate in at least two senses of the word. Once again, Eric, you resort to demeaning and dismissive rhetoric instead of arguing the facts. Typical of you. So why on earth would Jeff Denham vote for a bill that includes a provision far more important for his district (state water grab amendment) than the tunnel? Answer: because he’s protecting his district and not the dumb, dumb’s in the delta who are actually helping get the tunnels built by support the state’s water grab. For anyone who knows ANYTHING about water in CA, the state water grab is more detrimental to the Valley than the tunnels AND the only way the tunnels can get built is if they have LOTS of water running out to the Ocean instead to farmers in the central valley. So, to use Eric’s logic, Jerry McNerney is helping build the tunnels by not supporting Jeff Denham’s amendment. Maybe Mr. Smith, Jeff Denham is just trying to have it both ways. Makes more sense than your convoluted explication. Most close observers of the water grab think it’s connected to demands to send northern California south via the tunnels. And even without the water grab, the tunnels facilitate sending water south. Jeff Denham voted to fast track the tunnels and to fast track the California Water Fix. Think about it. Also, you appear to agree the water grab is about sending water via the tunnels. My question is, then why would to bash a person for trying to stop the water grab? Answer – you simply hate Jeff Denham and don’t care about the FACTS. Mr. Smith: No need to be sorry. You are a great resource and much appreciated. I do disagree with your explanation of Mr. Denham’s vote. I think a better explanation is that as a professional politician, Jeff Denham has mastered talking out of both sides of his mouth with equal volume and conviction. Oh,one more fun FACT for Eric to consider as I’m sure he’ll tell you about how great the state water grab is…. If the plan is so good for us, they why, in the entire record and supporting documents, is there no (ZERO) mention of climate change in the State’s water grab plan? Let that sink in… A plan produced by the state of California has NOTHING regarding climate change…. NOTHING. Why is that Eric? Mr Smith: Your attempt to put words in my mouth is an act of desperation apparent to our readers. Construction of straw man arguments and deployment of red herrings doesn’t work here, though it does provide occasional amusement. but the only red herrings in this entire article and comment section is your linkage of tunnels and Denham support while avoiding any discussion on tunnels, water grab and your democrat talking points. Please do you readers a favor and learn something about water policy before trying promote your Josh Harder love. No need to be sorry Mr. Smith. You are adding important evidence that Jeff Denham supports sending northern California water south. As for water policy, I thought I had mentioned Jeff Denham voted to prohibit litigation against the California Water Fix. But if I didn’t mention Jeff Denham voted to prohibit litigation against the California Water Fix, I thank you for bringing the omission to my attention. I do mean for people to realize Jeff Denham voted to prohibit litigation against the California Water Fix. Thank you again.